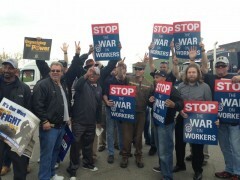 Michigan truck drivers, warehouse workers rally for union at Sysco | Fight Back! Grand Rapids, MI—Around 50 workers and drivers joined a Teamsters Union Local 406 rally outside the food distribution giant Sysco Corporation on April 29. A huge black and gold Teamster truck was parked just outside the Sysco warehouse, bordering the Gerald R. Ford airport in Grand Rapids. 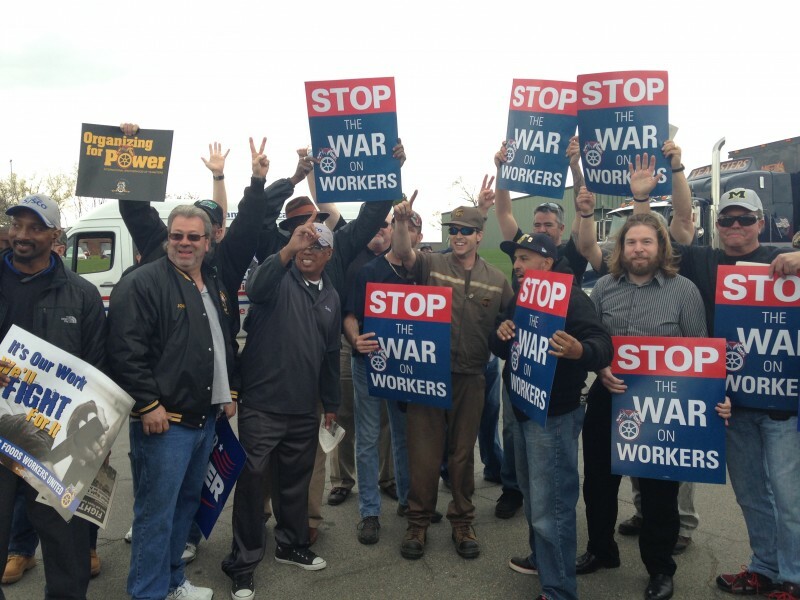 The workers held up Teamster signs reading, “Stop the war on workers,” as they lined both sides of the street. Passing truck drivers honked loudly in support of the union. The biggest issue for workers is seeing their paychecks shrink. Workers at Sysco called Teamsters 406 in November asking for help organizing. Sysco quickly hired a union busting firm to combat the workers having their own voice. Workers and drivers also say they need a union to combat the “WIP and DIP” program imposed on them by management. Warehouse Incentive Program (WIP) and Drivers Incentive Program (DIP) are ways to target and fire workers for minor infractions. It is being used to target workers organizing for their union. Over 160 drivers and warehouse workers are demanding Sysco recognize their union affiliation with Teamsters 406. They load and deliver food to hospitals, colleges like Michigan State University, restaurants, hotels and other large institutions. The so-called ‘Right To Work’ laws in Michigan are making union organizing harder, but determined workers are banding together to win.